To date this blog has contained only my own images, today I am both delighted and honoured to be able to publish a selection of images within this post that were created by the hand of another photographer. I'm not exaggerating when I say this unexpected episode has given me as much photographic joy as anything I have done for myself. I'd especially like to take this opportunity to thank the photographers family without who's gracious permission I would not be able to share these images. For that and the trust bestowed in me I am most grateful. I clicked on the email attachment, whilst the image of assorted camera equipment wasn't the best the list was clear enough..... Leica M5, 35mm Summicron f/2, 90mm Elmarit f/2.8 all caught my eye, words that meant nothing to me only a couple of years ago were now very much etched in to my photographic brain. Other lenses in both M & R mount were listed amongst a myriad of Leica equipment. The email arrived via the father of a friend, word of mouth regarding my fondness for all things Leica had ensured it found it's way to me, good fortune indeed. I phoned the contact number and made arrangements to view the items at the earliest opportunity and in doing so acquired not only a wonderful collection of vintage Leica equipment but also the opportunity to show the world the photography of Roland G Phillips-Turner, his film legacy so to speak. As I carefully packed away the equipment, the daughter and I began to chat about her late father and his photographic exploits, as I listened intently my connection to this newly inherited equipment grew stronger with each spoken word. All vintage equipment comes to you with a history, more often than not it's imagined on the part of the new owner, to actually know the story behind it makes it very special indeed. With this history comes what I would almost describe as a sense of duty, one I would come take very seriously, lenses have since been serviced and as I write this the M5 is at DAG in the US receiving the attention it deserves. Indeed, upon it's return from CLA the 35mm Summicron f/2 (Pre Asph) v.1 made its debut for me HERE. I'd describe myself as a rational person, I don't believe in such things as fate and destiny, but I have to admit its crossed my mind when it comes to this equipment. From opposite sides of the world, separated by two generations and via a huge slice of good fortune this equipment has landed in my possession, the survival and continued use of this Leica equipment is now ensured. Glancing up around the room my attention was drawn to a slightly faded image on the wall, "That's my father in the print, it's one of his" said the daughter. He sat, surrounded by bush, his back to the camera looking in the direction of a distant waterfall, the image bought the biggest smile to my face. As we sat and looked at more of the prints there was a casual mention of slides, "I'd love the chance to look at those sometime" I said or words to that effect. I left with a handful of borrowed Ansel Adams books that I would return in a few weeks once I had read through them. As I made the journey home I wasn't thinking about the equipment next to me, my thoughts were firmly on the slides. My interest had been piqued and they crossed my mind many times over the weeks that followed. Eventually it was time to return the books and in doing so maybe there would be an opportunity to view the slides, as I stood in the doorway I said "I've been thinking about these slides, I'd really love to see them and maybe to return the favour I'll scan them for you" Five minutes later and I was leaving with the slides, I think I made it maybe 4km's before I had to pull over and look, almost two hours past before I would commence my journey home. It seems only appropriate that this post contains a brief background from the family of Roland G Phillips-Turner, those that knew him best. "Dad was an ENT surgeon in Hamilton and it was Mr Attewell at Mannings the chemist who sold him all his equipment. Dad’s father had been originally a surveyor but finished up being the Director of Forestry for New Zealand, so he had an immense love of the open spaces before it was fashionable to be caring for the environment. He was also an artist focussing on outdoors New Zealand. So many of his photographic images were eventually transformed into paintings." "In his later years he was researching the reasons for deafness among many Maori children who at that time were largely living in rural areas. He would travel through remote areas to treat them. This was an enterprise he really enjoyed as liked the interaction with Maori communities in the Urewera and the East coast. It also gave him the opportunity to take interesting photographs." 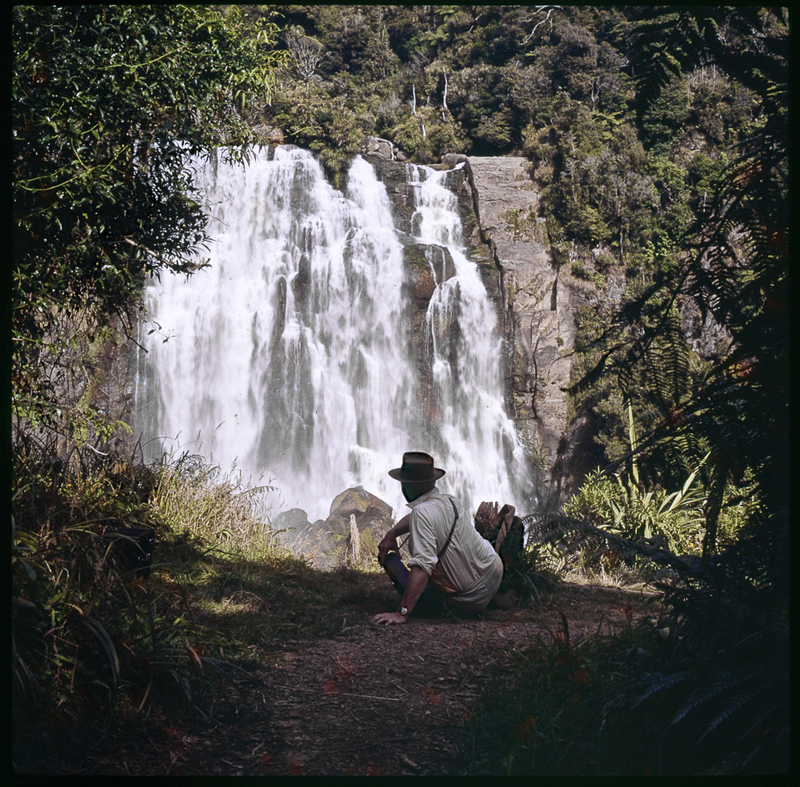 I was so pleased to find this amongst the negatives, after some research I've been able to establish that it was taken at Marokopa Falls in the Waikato. It was also fascinating to discover that the photographer used the Hasselblad 500c for the medium format work. I had also purchased a 500c from the USA a month or so before coming across the slides, just another wonderful coincidence. 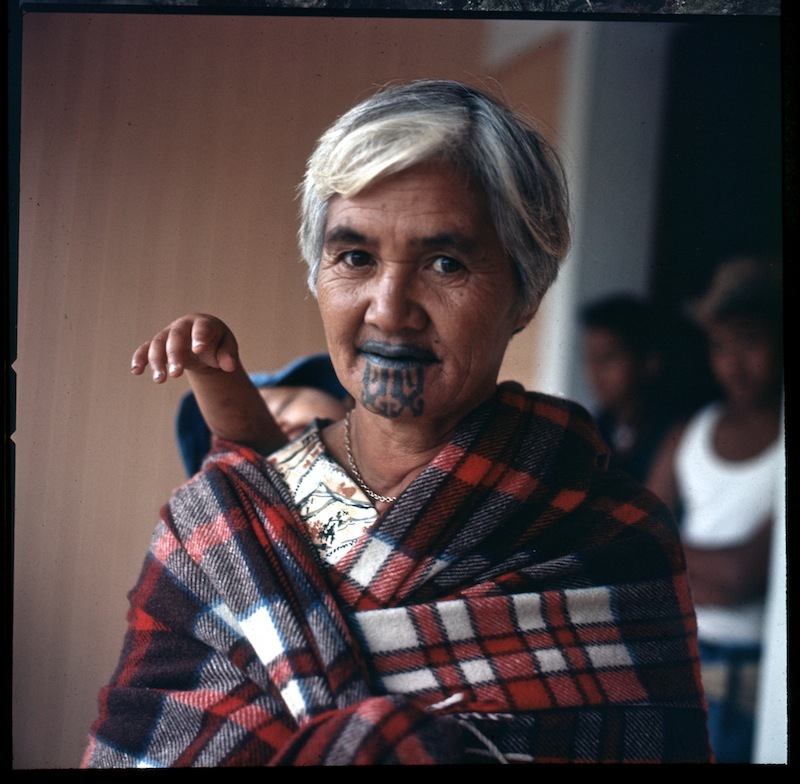 Kuia with a moko - "Kuia" being an elderly woman, grandmother or female elder and the "Moko" is the Maori facial tattoo. Image taken with the Leica M5 and most likely with the VISOFLEX that was also included within the set of equipment. Deer Hunters in the Urawera's, a rural scene that is no doubt still repeated in the present day. Around 18 months ago I picked up on what was quite a high profile news story here in New Zealand regarding the Te Urewera region and terrorist charges being laid against some of its inhabitants. Being something you wouldn't generally associate with this country it piqued my interest in the region which is maybe 2 hours drive southwest of where we live and I started to do some research of my own. Encircled Lands by Judith Binney details the history of the Te Urewera region and it's people the Tuhoe from 1820 - 1921, it is colourful to say the least. The issues are complex yet at the same time simple, sovereignty over its own lands being at the heart of the matter. These images have once again awoken my interest in the Te Urewera region and I plan to visit in the near future. In this image Mount Ngauruhoe appears to be active. You may recognise this volcano as Mt Doom from the Lord of the Rings Trilogy. Anyone who follows the news in New Zealand will know Mount Tongariro, the neighbouring volcano has also erupted quite recently. 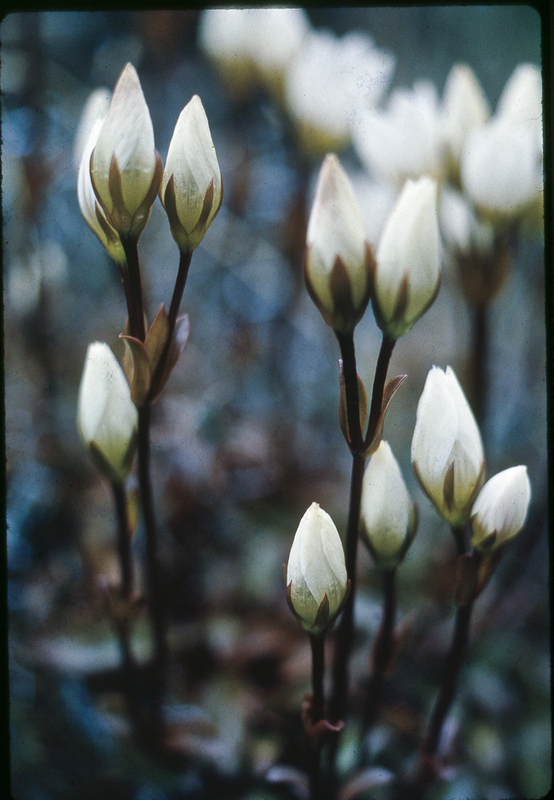 I've found myself to be surprisingly fond of the New Zealand flora images in this collection which I think work particularly well on the Kodachrome film. Its easy to understand a photographers fascination with more remote regions like Te Urewera as they remain rich in Maori culture even today. Ruatahuna in the Te Urewera - whilst its been possible to identify the locations of certain images you have to let your imagination fill in the blanks in terms of the image content, I don't mind this. In years to come will people have similar experiences to the one I have just shared with you? What is the likelihood of my photographs being rediscovered 40 or 50 years from now? You would have to say, highly unlikely! Film has made this discovery possible, it has preserved these images beautifully and ensured their survival to date. Boxes of slides, stored in an attic, a garage, who knows where, you open it, hold it to the light and instantly you can see the magic, will people recover digital images from old hard drives in this way? I can't see it myself........only film can make this possible. I already had an affinity with film, this experience has strengthened that bond still further, I never say shoot film over digital, I always say shoot both. There is true value in both media. The images posted here are indicative of the collection I have been entrusted with and I will continue to share them over the coming weeks and months, I hope you'll join me and follow these posts with interest. This has been the most heartwarming discovery, one that resonates on so many levels, I'm delighted to have be able to share it. Note: I have undertaken some dust removal only where I felt it was a distraction from the image.